The optic nerve (CN II) is the second cranial nerve, responsible for transmitting the special sensory information for vision. It is developed from the optic vesicle, an outpocketing of the forebrain. The optic nerve can therefore be considered part of the central nervous system, and examination of the nerve enables an assessment of intracranial health. Due to its unique anatomical relation to the brain, the optic nerve is surrounded by the cranial meninges (not by epi-, peri- and endoneurium like most other nerves). In this article, we shall look at the anatomy of the optic nerve – its course, sensory functions and clinical relevance. Fig 1 – Overview of the anatomical course of the optic nerve. 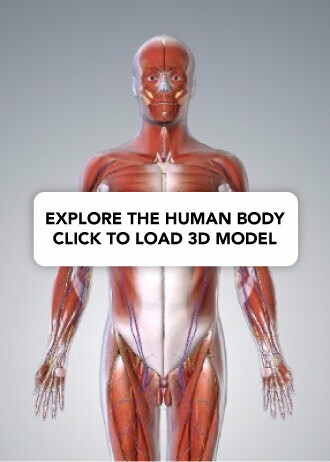 The anatomical course of the optic nerve describes the transmission of special sensory information from the retina of the eye to the primary visual cortex of the brain. It can be divided into extracranial (outside the cranial cavity) and intracranial components. The optic nerve is formed by the convergence of axons from the retinal ganglion cells. These cells in turn receive impulses from the photoreceptors of the eye (the rods and cones). After its formation, the nerve leaves the bony orbit via the optic canal, a passageway through the sphenoid bone. It enters the cranial cavity, running along the surface of the middle cranial fossa (in close proximity to the pituitary gland). 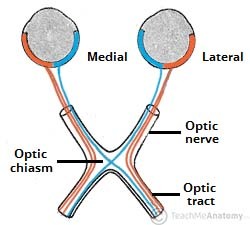 Left optic tract – contains fibres from the left temporal (lateral) retina, and the right nasal (medial) retina. Right optic tract – contains fibres from the right temporal retina, and the left nasal retina. 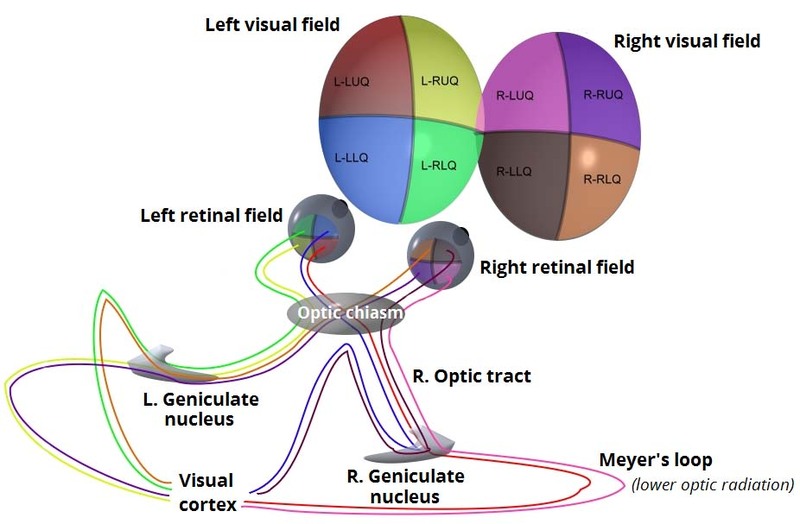 Fig 2 – The nasal retinal fibres crossing over at the optic chiasm. Each optic tract travels to its corresponding cerebral hemisphere to reach the lateral geniculate nucleus (LGN), a relay system located in the thalamus; the fibres synapse here. Upper optic radiation – carries fibres from the superior retinal quadrants (corresponding to the inferior visual field quadrants). It travels through the parietal lobe to reach the visual cortex. Lower optic radiation – carries fibres from the inferior retinal quadrants (corresponding to the superior visual field quadrants). It travels through the temporal lobe, via a pathway known as Meyers’ loop, to reach the visual cortex. Once at the visual cortex, the brain processes the sensory data and responds appropriately. Fig 3 – The optic pathway. Fig 4 – Bitemporal hemianopia, affecting the lateral visual fields in both eyes. A pituitary adenoma is a tumour of the pituitary gland. Within the middle cranial fossa, the pituitary gland lies in close proximity to the optic chiasm. Enlargement of the pituitary gland can therefore affect the functioning of the optic nerve. 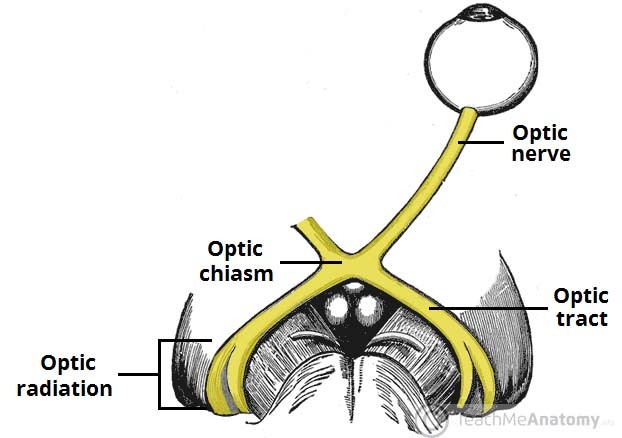 Compression to the optic chiasm particularly affects the fibres that are crossing over from the nasal half of each retina. This produces visual defect affecting the peripheral vision in both eyes, known as a bitemporal hemianopia. Surgical intervention is commonly required. To access the gland, the surgeon uses a transspehenoidal approach, accessing the gland via the sphenoidal sinus. Which retinal fibres are present in the left optic tract? Which cranial nerve is the optic nerve? Which of these conditions is a pituitary adenoma most likely to cause?